In June, 11 Washington Youth Soccer players were hand-picked by Elite Player Development (EPD) program staff to attend a prestigious identification camp established by U.S. Soccer head coach Jill Ellis. The purpose of the camp was to uncover as-yet-undiscovered players throughout Region IV ODP, who coaches thought had the talent to compete at the international level, but had so far been overlooked by the national team system. 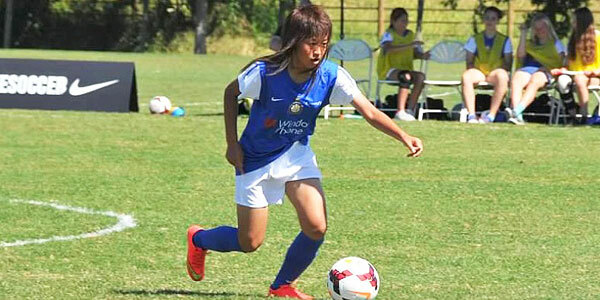 In August, one of the 11 Washington Youth Soccer invitees, Eastside FC's Sakura Yoshida, earned her first-ever call-up to the U.S. Women's Youth National Team, joining 35 fellow Under-14 girls, including fellow EPD player Summer Yates of PacNW SC, for a week-long training camp in Orlando, Fla. It was the first-ever call-up for Yoshida and a validation that the identification camp had indeed served its purpose in finding new, undiscovered talent. "The camp was a great experience," Yoshida recalls. "Not only getting a chance to show the national staffs what I've got, but playing with top players from other states. Learning and playing with them made me a better player." The 11 Washington players selected to attend June's identification camp are all part of Washington Youth Soccer's unique Elite Player Development program, which mimics the national team development model by drawing together the best players from clubs statewide to represent Washington Youth Soccer in regional and national training and competitions. In addition to Yoshida, numerous other Washington players have reached national or international acclaim after participating in EPD, including all three Sounders FC homegrown players - World Cup star DeAndre Yedlin, Sean Okoli and Aaron Kovar - U.S. Under-20 National Team Head Coach Michelle French, and U.S. Women's star goalkeeper Hope Solo. On top of that, over 20 EPD players have been invited to youth national team camps in the past two years. "The EPD program is an intense environment; every session and game is challenging," Yoshida says. "The program helped me develop as a player significantly, technically and tactically. Getting coached by different staff helped me adapt to a different style of play. I also was able to get used to traveling on my own, and gained more confidence with what I'm good at. I'm honored to wear the crest, representing the country and Washington Youth Soccer." To learn about Elite Player Development, click the Programs tab above, or visit this page: http://www.washingtonyouthsoccer.org/programs/elite_player_development/.